Ethical vegetarianism has a several thousand-year history in India, and vegetables, legumes, and grains lie at the center of the country’s varied regional cuisines. But more than half of India’s 1.17 billion people now consider themselves omnivores. It is India’s booming middle class—estimated to number between 50 million and 250 million—that is driving up demand for meat, eggs, and dairy products (milk has long been a staple of most Indian diets). India has the world’s largest dairy herd (comprised of cows and buffalo), about 300 million strong, and is second only to the United States in milk production. India is also the world’s third largest global producer of eggs and the world’s sixth largest producer of poultry meat. Even though livestock-industry analysts predict that Indians won’t ever consume as much animal protein as the Chinese or Americans do, the size of India’s population, the second largest in the world, magnifies the impact of even small changes. Veg or Non-Veg? 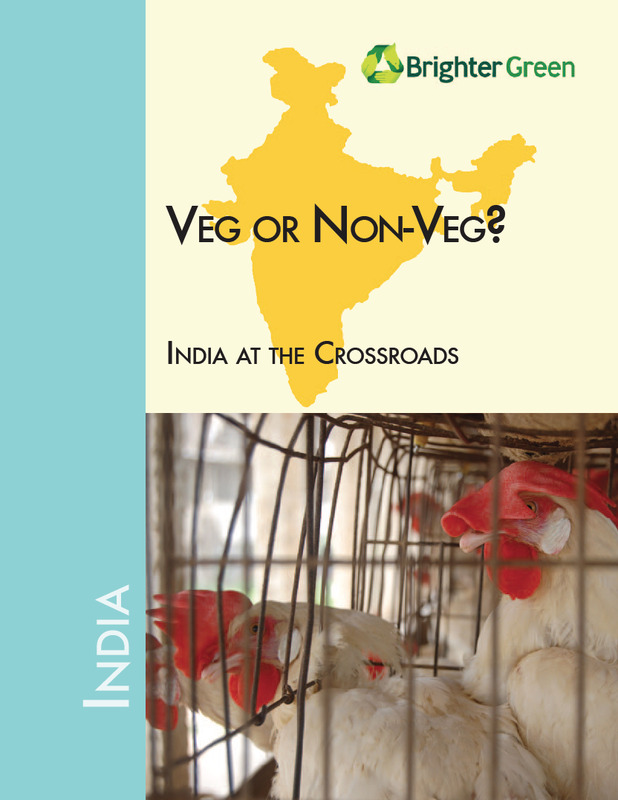 India at the Crossroads (PDF) analyzes the forces behind the rising consumption and production of meat, eggs, and dairy products in India, and the effects on India’s people, environment, animals, and the global climate. 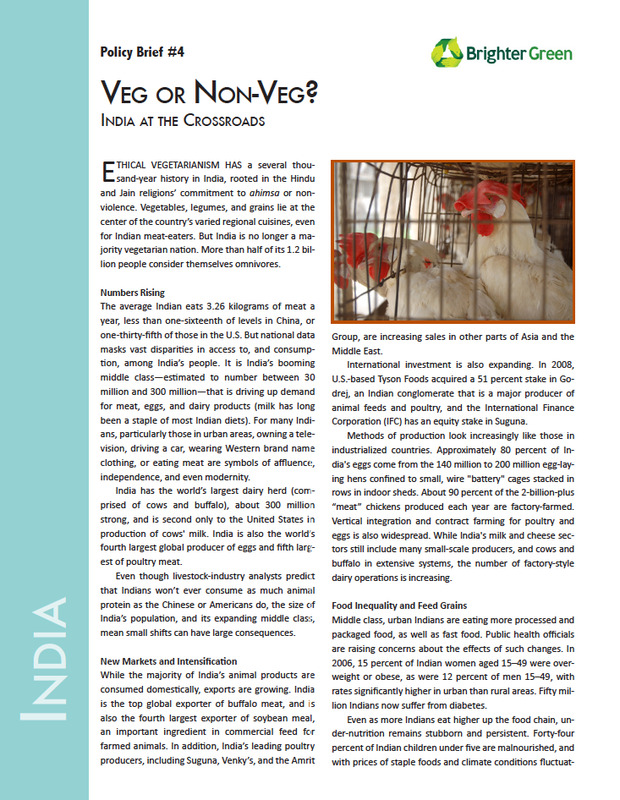 It will explore whether India, with a long vegetarian tradition, a fast-urbanizing, and growing population, an expanding middle class, as well as hundreds of millions of undernourished people living in poverty can—or should—use its natural capital to produce (and export) more animal products in an increasingly industrial landscape. Below is a full-length policy paper, a two-page policy brief based on the paper, and short documentary videos outlining the key issues covered in the policy paper. *This video is a combination of Brighter Green’s three videos documenting India’s growing intensification of the poultry, egg, milk, and beef sectors included some updated data from 2012. Links to view the original videos can be found below.